Want to help make your campus and community a more sustainable place – and be recognized for your efforts? Wilfrid Laurier University is one of 14 Canadian postsecondary institutions piloting the World Wildlife Fund Canada (WWF-Canada) Living Planet @ Campus program, which creates opportunities for students to participate in sustainability initiatives on campus and beyond. 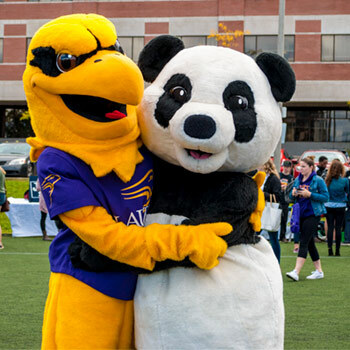 “The WWF partnership is exciting because it provides students with individual recognition from one of the best-known environmental brands in the world,” says Tyler Plante, program coordinator at Laurier’s Sustainability Office. The pilot, launched earlier this fall, explores strategies to increase and strengthen student engagement with sustainability initiatives. It aims to increase postsecondary students’ understanding of and contribution to sustainability and the protection of nature. Findings from this pilot year will inform the design of a national program, set to launch in Sept. 2018. During the pilot phase, you can register with the WWF-Canada Living Planet @ Campus program to learn more about how to participate in activities and contribute to the development of the national program. Campus community and global volunteerism. Volunteer with a community or campus club, or take sustainability abroad with an exchange program. Application of sustainability in academics. Learn more about sustainability and issues related to environmental resilience with sustainability-focused degree courses or find unique ways to apply sustainability to your academic program. Student leadership and teamwork. Work with classmates, friends or teammates to get involved with sustainability initiatives on campus. Personal application of sustainability. Incorporate sustainability into everyday living (e.g., recycling, composting, conserving energy, diverting waste through the Move-Out program). As a student, you can also apply to have your campus sustainability idea or project funded through WWF-Canada's Go Wild School Grant program. Grants of up to $500 are available. The application period closes Jan. 31, 2018. You can stay current with sustainability-related events at Laurier through the university event calendar or by following the Sustainability Office on Facebook and Twitter. Questions about the WWF-Canada Living Planet @ Campus pilot program at Laurier can be sent to Tyler Plante at tplante@wlu.ca.